Unsurpassed quality abounds in your birding sanctuary with the Heartwood Ivy Bird House. 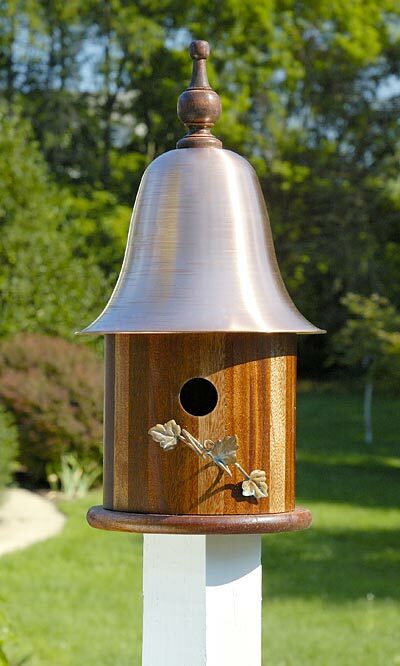 This remarkable bird house features the fine craftsmanship of a hand-oiled mahogany base complemented by the impressive stature of a shiny copper, bell-shaped roof. A stained wooden finial tops the copper roof and is completely removable to enable seasonal cleaning or nest observation. A curled stem of copper ivy embellished with a tendril and verdigris ivy leaves makes a decorative yet functional perch for your feathered friends. Place this bird house on any flat surface or use the included mounting plate and screws to post mount. Include the Ivy Bird House as part of your garden or landscape. Made in the USA.